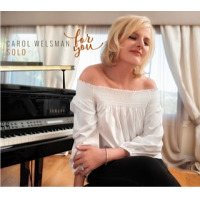 Canadian jazz pianist and vocalist Carol Welsman unveils her eleventh album as leader with the audacious Alone Together where she's never alone and altogether very spicy and splendid on vocals as well as on the keys. The album contains a superb selection of time-honored standards like Sammy Cahn's "Day By Day," Rodgers & Hammerstein's oft-recorded "It Might As Well Be Spring," Duke Ellington's classic "I Didn't Know About You" and of course, the Arthur Schwartz/Howard Dietz 1932 title song, "Alone Together" among many others. A recipient of many Canadian Juno Awards nominations for several of her previous ten albums, Welsman, a former Toronto native, now embraces the standards from her new base and home in the Hollywood Hills central region of the City of Los Angeles. The songstress adds her lush cushy vocals to a new interpretation of jazz and classic standards that comes off quiet well here especially, because she assembles an A-list of players that also provide their own imprint on the music making this a vocal jazz project bolstered by excellent instrumentals. Drummer Lewis Nash and trumpeter Wallace Roney are both pronounced on the opening "Day By Day" where bassist of note Rufus Reid also weighs in as the vocalist does some swinging scatting. Borrowing lyrics from the late great cabaret singer Bobby Short, Welsman belts out the song "Sand in My Shoes" with gusto with a little help from guitarist Jay Azzolina, and percussionist Steven Kroon. Delivering a fresh new treatment of an old warn-out classic, the familiar title song undergoes a metamorphosis of sorts with Nash pounding the drums and the vocalist pounding the keys, some high-note reaching and more scatting in a great arrangement of the standard. One of the many beautiful songs on this disc is, "You Taught My Heart to Sing" where Welsman takes the Dianne Reeves lyrics and puts a new spin on it assisted by a humble bass line solo from Reid and some engaging guitar riffs from Azzolina. The blues are in order on the swinging "The Blues Are Out of Town," featuring some nice horn play from Roney, while Ellington's immortal love song "I Didn't know About You" is voiced softly and gentle as it was penned to be. Vocalist and pianist Welsman goes it alone on the Carolyn Leigh/Jule Stein finale singing softly and playing a tender chords befitting the tender tune "Killing Time." 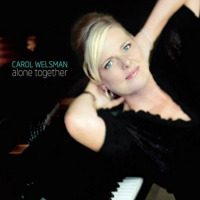 For those who can appreciate the splendor of the standards, Carol Welsman's Alone Together is an impressive vocal jazz album that captures the music of the ages and the emotions of love songs forged here by the rich lush vocals of a beautiful singer and a talented pianist all in the same person. Track Listing: Day By Day; It Might As Well Be Spring; Sand In My Shoes; My Ship; Alone Together; Disappointed; If The Moon Turns Green; You Taught My Heart to Sing; The Blues Are Out of Town; I didn't Know About You; Killing Time. 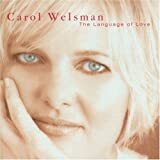 Personnel: Carol Welsman: piano, vocals; Rufus Reid: bass; Lewis Nash: drums; Wallace Roney: trumpet; Jay Azzolina: guitar (3, 6, 8, 10); Steven Kroon: percussion (3).